Q: According to reports, a "lawmaker" from Taiwan's Democratic Progressive Party said on social media that it was because the mainland accepted El Salvador's request to provide over 27 billion dollars that El Salvador established diplomatic relations with the mainland. What is your comment? 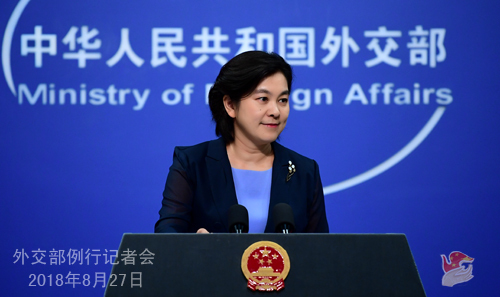 A: China and El Salvador established diplomatic relations on the basis of the one-China principle, which accords with the international law and basic norms governing international relations. It is justified and aboveboard. The Salvadorian government just made the same right choice as the UN and other 177 countries already did. The one-China principle is by no means a bargaining chip, and will never become one. When establishing diplomatic relations with China, the Salvadorian side never proposed any economic preconditions. There is no such thing as the so-called "bargaining". The relevant person who claimed the so-called "checkbook diplomacy" is fabricating something out of thin air, deceiving himself and judging others by himself. Q: According to Japanese media reports, the DPRK has released a Japanese man who was originally detained there. This man has now arrived in China presumably on his way back to Japan. Can you confirm that and do you have any details? A: I'm not aware of the situation you mentioned. Q: Reports say that on August 24, for the first time, both Pakistan and India took part in the anti-terror exercise called "Peace Mission-2018" of the Shanghai Cooperation Organization (SCO) in Russia. Officials from the defense ministries of Pakistan and India said that they believe the two sides can learn from each other and it provides a unique opportunity for them to exchange experience. What is your comment on the exchanges and cooperation between Pakistan and India? A: We welcome the joint participation of Pakistan and India in the anti-terror exercise under the SCO framework. Both Pakistan and India are important countries in South Asia. A stable Pakistan-India relationship is of great significance to the peace and stability of the region and the peace and development of the world. We sincerely hope that the two countries can strengthen dialogue and cooperation bilaterally and within such multilateral mechanisms as the SCO, improve their relations and jointly uphold regional peace and stability. Q: After the US and Australia banned Huawei and ZTE from supplying telecommunications equipment, the Japanese side also decided to ban Huawei from entering its market. What's your comment? A: We have noted relevant reports. As far as I know, the Japanese government didn't make such remarks. If I remember correctly, this is just what Sankei Shimbun reported. 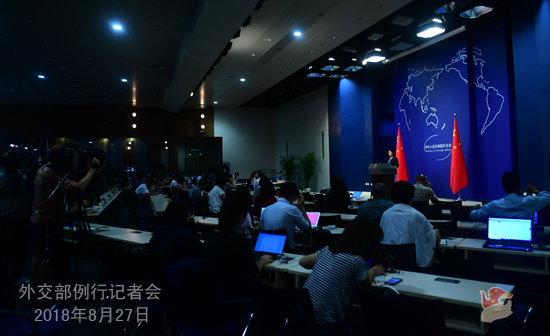 The Chinese government always encourages the Chinese enterprises to conduct economic cooperation overseas on the basis of abiding by international rules and local laws. 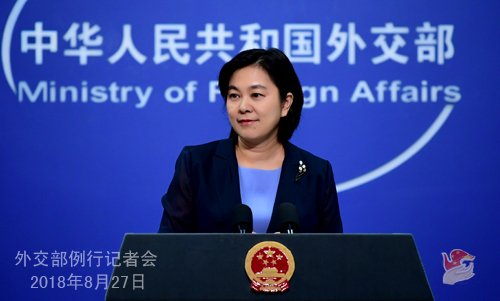 The cooperation between Chinese and foreign enterprises, including Japanese ones, is mutually beneficial and win-win in nature, and in line with international rules as well as local laws and regulations. We are concerned about relevant reports and will try to check on and verify the situation. We hope that the Japanese side will provide a fair, transparent and just environment for Chinese and Japanese enterprises to carry out normal and mutually beneficial and win-win cooperation, instead of the opposite.